Like many fine foods… strawberries, cider, and asparagus, Vermont Shepherd cheeses are seasonal. Our summer cheese, “Verano,” we make from pure sheeps’ milk when our pastures are abundant with wild herbs and grasses. Verano then ages 3-5 months and ripens by August. The flavor of the summer cheese is sweet, rich and earthy with hints of clover, mint, and thyme. 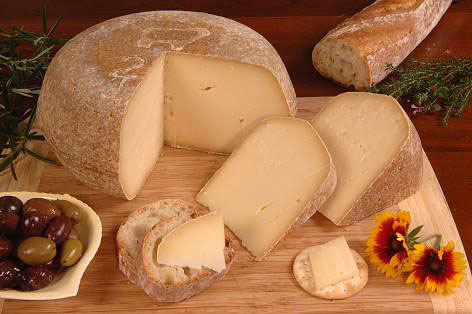 Our winter cheese, “Invierno,” we make from a mix of our sheeps’ milk and rich, organic milk from our neighbors cows. Invierno ages 5-9 months and ripens by early winter. The flavor of the winter cheese is strong and full, with a spicy tang. We sell the summer and winter cheeses by the pound and by the 6 to 8 lb wheel. In addition, we make a smoked version of the Invierno cheese. This we make by smoking the wedges in smoke from our own apple tree wood. These are dipped in red wax. Our sheep produce a beautiful, lusterous wool. We shear them once a year in late February and March, right after we bring them off the snow and into the barn. This wool, directly off the sheep and full of its natural lanolin is "raw" wool. After we wash (or "scour") the wool, we card it. This product, known as "carded wool" is excellent for stuffing, felting or processing further into yarn. We have a few black-wooled sheep in our mostly white wool flock. This allows us to have both a natural white yarn, as well as a grey, or pepper-colored yarn. The yarn we sell in 4 oz skeins and is processed for us by the Green Mountain Spinnery - a little mill in our town that produces many lovely natural fiber yarns. Our wool is a lusterous, medium grade fiber, with a good crimp. It has a 3 to 4 inch length ("staple"). The yarn is a worsted weight 2 ply yarn. We carry four types of sheep milk soap. These are gentle, naturally scented soaps made by our neighbor, Judy Lidie of "Grace and Miss Mouse Soaps," from our sheep milk.